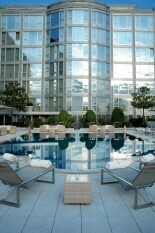 Luxury Hotel President Wilson offers 180 rooms and 48 luxuriously renovated suites. The interior design unites classical and contemporary designs with a uniquely stylish effect. 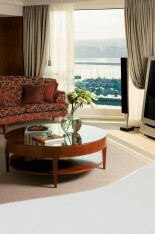 The rooms offer stunning views of the Lake and the city of Geneva. For further information on the accommodation please see the side menu. 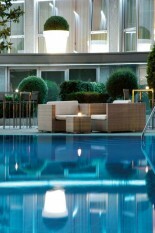 The President Wilson Hotel overlooks the imposing panorama of Geneva Harbour and Mont Blanc. The Cointrin International Airport is located 20 minutes by taxi from the hotel. Flights to Geneva from a host of European, North American and Asian cities are available from a multitude of airlines. Luxury, five Star, Hotel President Wilson is located in the heart of Geneva and offers stunning views of the Lake and Mont Blanc. With 180 rooms and 48 luxuriously appointed suites, this hotel offers exclusive accommodation to its discerning guests, including the Royal Penthouse Suite which is one of the finest and most lavish hotel rooms available in the world. The choice of many a dignitary, the five-star luxury Hotel President Wilson is an elegant hotel offering a world of unique privileges. Located just steps away from international organizations and chic boutiques, it is perfect for the business traveler or those wishing to take in Geneva’s attractions. This luxury hotel offers a state of the art fitness centre, an open air seawater swimming pool, a luxurious SPA and beauty centre and two fine dining world class restaurants. Recently refurbished in 2008 each guest room is decorated and furnished in a contemporary style and offers the most up to date communication facilities and magnificent views. The combination of modern conveniences and local traditions mixed with exceptional views of the lake creates a decadent atmosphere at the Hotel President Wilson. With two opulent and unique bars and two fabulous restaurants as well as a beautiful sky deck, this remarkable hotel is a unique experience in which to indulge your senses in luxurious surrounds. The President Wilson Hotel deserves its reputation as one of the world’s best hotels. Hotel President Wilson offers a stunning pool and outdoor area as well as a state of the art fitness centre, SPA facility and beauty centre. With two fabulous restaurants on site as well as a business centre and huge banquet and meeting rooms this hotel offers it all. Its fabulous location in the heart of Geneva offers shopping, theater and museums all within easy walking distance.